Fort Huachuca, AZ – At a modest ceremony in a hangar at Libby Army Airfield July 19th, a monumental moment transpired in the field of Army Special Operations Aviation. The Quick Reaction Capability 2, an unmanned aerial systems company, based at Fort Huachuca, AZ, received official authority to wear the U.S. Army Special Operations Command shoulder patch, indicating their attachment to the 160th Special Operations Aviation Regiment (Airborne). The 160th SOAR Commander, Col. John Thompson, and Regiment Warrant Officer, Chief Warrant Officer 5 Bob Witzler, presided over the ceremony and presented USASOC patches to the company commander and first sergeant. 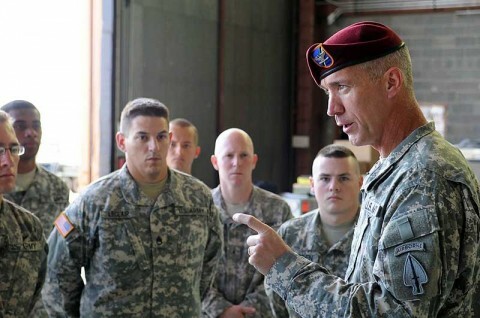 Thompson addressed the Soldiers informally after the ceremony, assuring them that he has faith in their abilities and looks forward to their successes as the newest Night Stalkers. The QRC2 is currently preparing to deploy to Afghanistan in support of special operations forces for Operation Enduring Freedom. Kim is certain his troops are ready for anything required of them. The MQ-1C Warrior Company was created in September 2009. The company of 17 Soldiers and 35 civilian contractors will be attached to the 160th SOAR during its deployment to Afghanistan.